We go to several holiday parties over the course of this month, which can sometimes be hard as our boys can have moments of being picky eaters. It's hard sometimes at a large, busy meal to try and get them to really eat much of anything. So I'm often trying to thing of something I can bring that I know I can get into them easily. The one thing both my kiddos consistently love are fresh fruit and veggies. 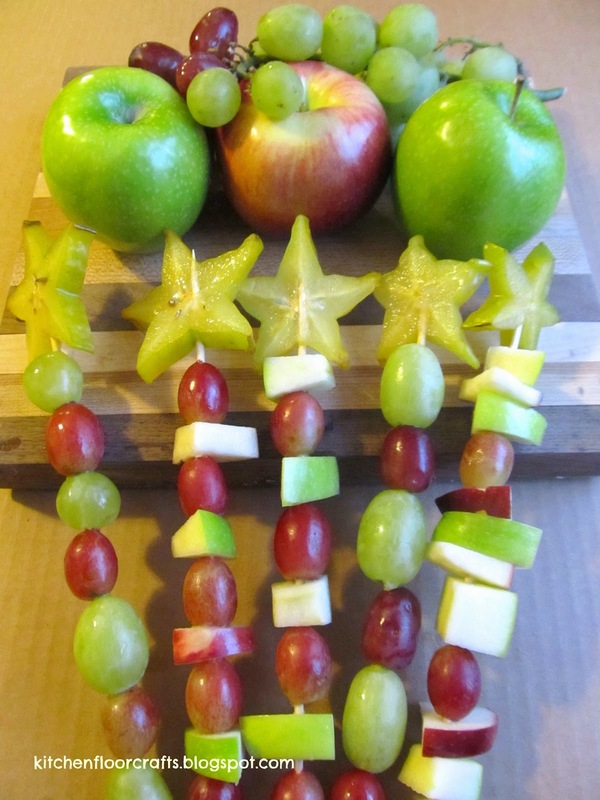 We like to put a fun spin on the traditional fruit and veggie platters though to match the holiday season. 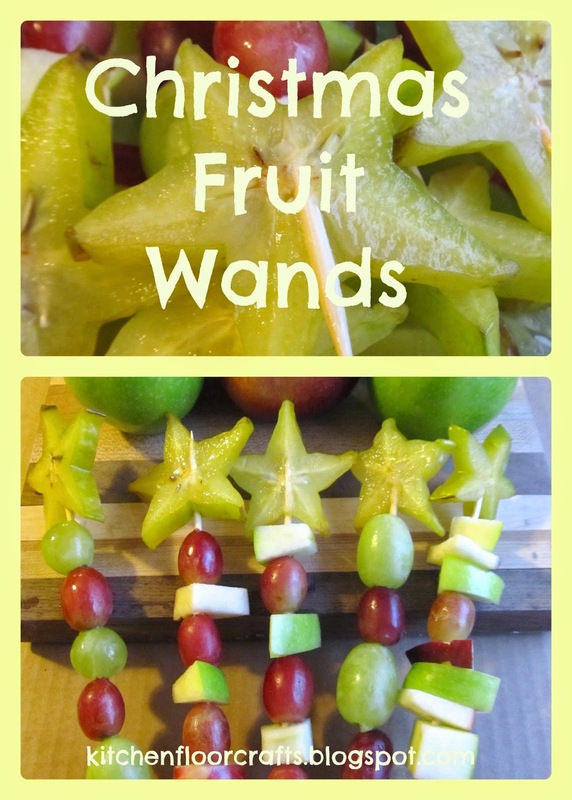 Last weekend for our first holiday event we tried making Christmas Fruit Wands. 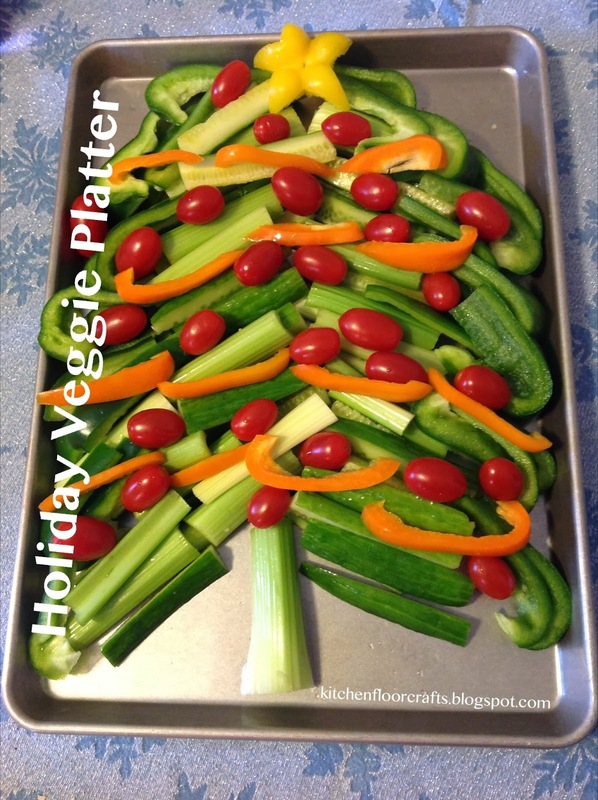 Last year we had a lot of fun creating our Holiday Veggie Platter for several events. This year we know we'll make some of those again, but we also wanted to create something new. 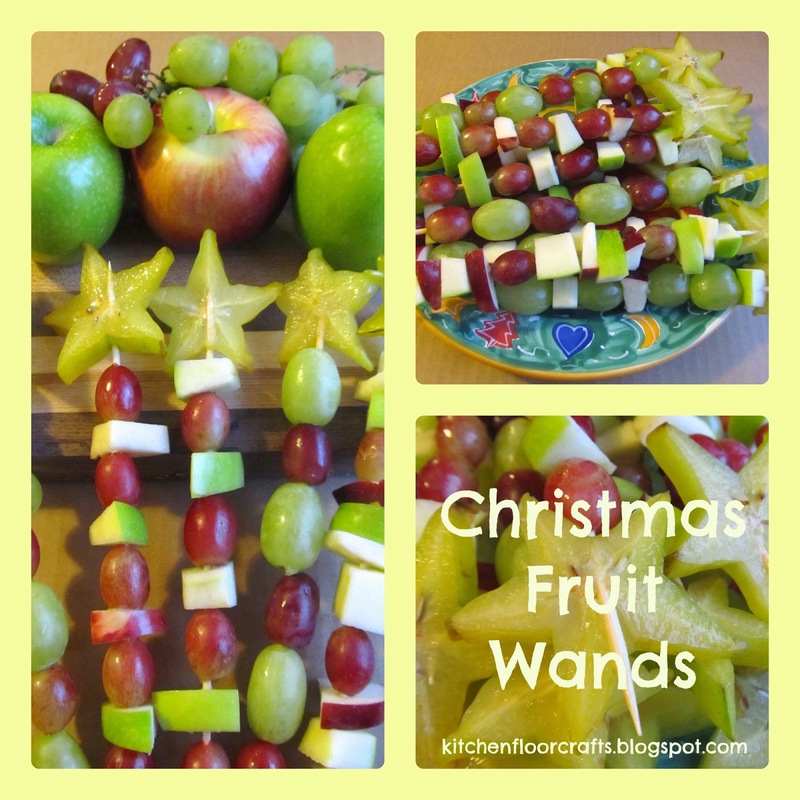 So we came up with Christmas Fruit Wands. This recipe makes about 12 wands. 1. Wash and cut up the apples. Soak the apples in a little lemon juice and water for several minutes. Wash the grapes. 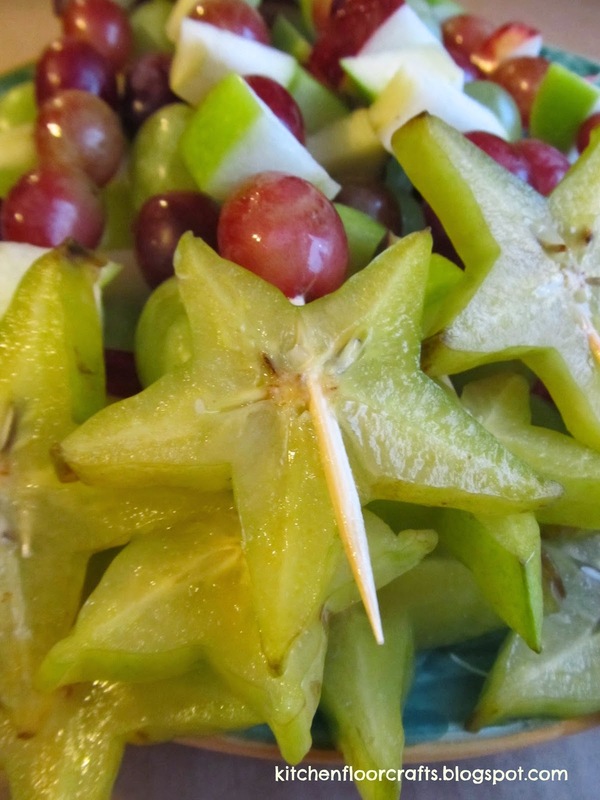 Wash and carefully slice the star fruit into about 1/4 inch slices. 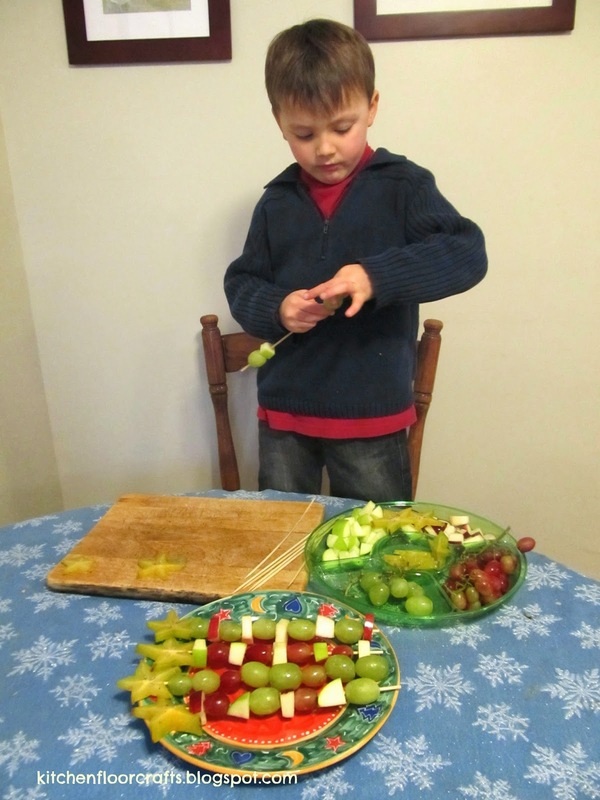 Big Brother was eager to help, so I put all the fruit onto a snack tray for easy assembling. 2. Start with the "pointy end" of the kabob skewer and thread fruit onto the stick, pushing it all the way to the bottom of the skewer. 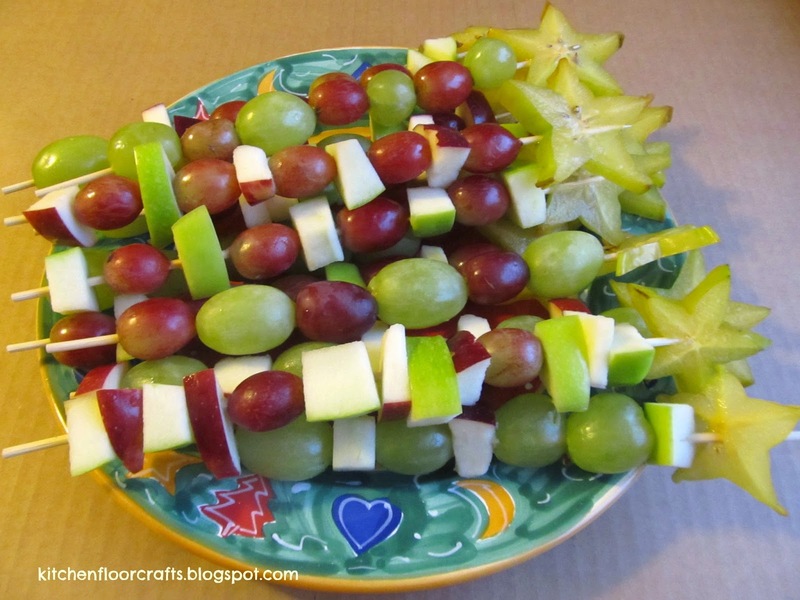 Continue with other fruit until the skewer is almost full. We had a lot of fun creating different patterns with the fruit. 3. At the end very end of the skewer, the point end, put on one slice of star fruit to make the top of the "wand." 4. 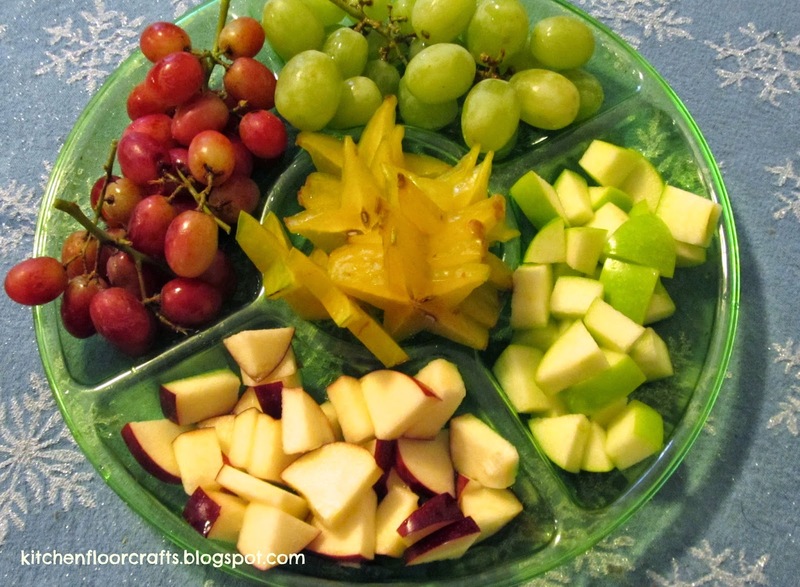 We made a whole plate full, each one had slightly different fruit and color patterns. These were a huge hit at the event we went to, all the kids made them quickly disappear. Plus they were a lot of fun for Big Brother to help with because he could be really hands on with making this treat; as he told one person "we didn't even have to bake them." We've got several other events planned that they'll be making an appearance at this year. Do you have a party these would be a perfect treat for? Labels: Christmas, family friendly food, holiday food, holidays, kid friendly food, Kids Cook!